Captain Dean Brown began his law enforcement career with the Ontario Police Department in 1985 as a Police Cadet. After graduating from the 83rd session of the San Bernardino County Sheriff's Academy in 1986, Captain Brown has worked many varied assignments. He is a commercial rated pilot and spent many years as a pilot with the department's Air Support Unit. He has worked investigative assignments including Financial and Economic crimes and as a member of the department's Homicide Investigations Unit. He was a supervisor with the Ontario/Upland Narcotics Task Force as well as the Ontario International Airport Narcotics Interdiction Unit. Captain Brown was also a supervisor in the Department's Internal Affairs Division. 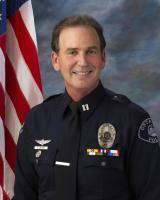 Captain Brown has local ties and is a 1982 graduate of Chaffey High School. He is a veteran of the United States Air Force/Air Force Reserve. He is a graduate of the prestigious FBI National Academy Class 272 in Quantico Virginia. Captain Brown is a graduate of the University of La Verne with a B.S. degree in Public Administration and from California State University, Long Beach with an M.S. degree in Emergency Services Administration.